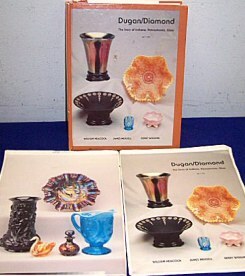 Left - Photo of the original Dugan-Diamond Book presented to the Dugan family upon publishing. Right - Presentation signatures inside cover of the Dugan family copy. Still retained by family members in PA.
We have become acquainted with a daughter (Paula) of the last surviving original Dugan family member who still lives in Pennsylvania. 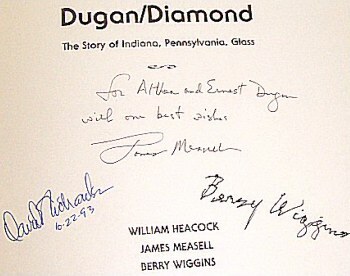 We have exchanged emails on occasion, and she provided the two photos taken of the Dugan book showing autographs/data surrounding the presentation of the complimentary copy by authors Heacock, Measell, and Wiggins. Left - 9 in. APPLE BLOSSOM TWIGS - in the tooth edge type. Smooth Edge plates are known in Peach Opal and Amethyst. Right - BORDER PLANTS in a dome footed hand-grip - CRE plate. APPLE BLOSSOM TWIGS: Two versions of edge treatments exist in the 9” flat plates. (This is a very good place to point out that scooped or ruffled edges do not constitute a plate in the true sense of the word.) A true plate shape must have extended edges which lay flat and not be more than an inch from the surface it sits on. There are smooth edge with plain exterior and fluted edge plates having Big Basketweave exterior. Cobalt blue plates appear rather often in this pattern, and during the years when Don Moore was alive and writing a great deal about carnival glass, he reported a light blue 9” plate; possibly celeste blue? Don has been gone from our midst for nearly 15 years, and we wonder where that plate is? Dozens of auctions have come and gone without its appearance. Plain edge plates are known in amethyst and peach opalescent. Fluted edge plates are found in marigold, amethyst, peach opalescent, white, cobalt, and perhaps this light blue example which has gone astray. 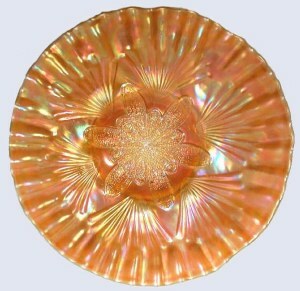 BORDER PLANTS: is a dome-footed piece, 8”-9” in size for these handgrip “plates”, whether they be straight edge or crimped, as is this peach opal example. The amethyst handgrip plate is more rare than peach opal, and you can view one by clicking on - - in our pattern index on the homepage. No white examples in this pattern have ever surfaced. Since white carnival went into production about December 1911, and the destructive fire occurred in 1912, we might conclude that the mold was among those which did not survive that catastrophe. The pattern is a scarce one. A rose bowl shape, 8” handgrip bowls and 8”-9” handgrip plates are known only in amethyst and peach opalescent. The 8”-9” dome-footed bowls are found in marigold, amethyst, peach opal and oxblood. CHERRY: We display the peach opalescent example in collar-base with patterned interior / Jeweled Heart exterior in 6” size. There are 8”-10” ruffled bowls, 8”-9” deep round bowls, 5” deep round , 8”-9” low ice cream shape, and 6”-7” plates in peach opal, as well. There is a footed version in this pattern, which we will discuss in a future segment. 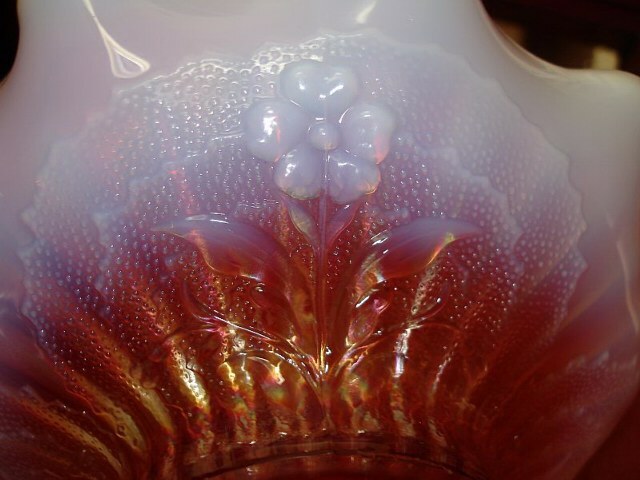 Virtually all the Dugan bowl and plate patterns which carry the Jeweled Heart exterior design (including this Cherry pattern) disappeared from ads in wholesale catalogs after the 1913 changeover in management when Dugan became Diamond Glass Company. 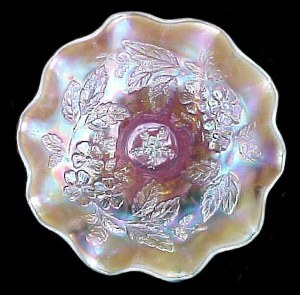 The small “plates”, many times have a crimped edge and are found in amethyst, peach opal, oxblood. Amethyst and peach opal are colors found in round bowls. 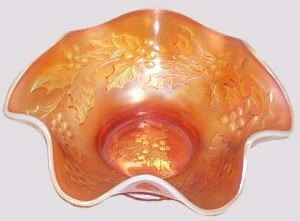 Marigold, amethyst, peach opal, white and oxblood are known in ruffled bowls. Picture provided by Barbara Harriman. This displays the similarities of Single Flower and Single Flower Framed. Displaying the exterior of SINGLE FLOWER FRAMED, this 7" ruffled bowl does not have a crimped edge--and is neither a flat plate or a handgrip plate. The interior design is Smooth Rib. Both Single Flower designs date from the 1909-1911 time period when they appeared in wholesale catalogs.Both disappeared after the 1912 fire, believing the moulds were destroyed. Single Flower Framed is known in Peach Opal, as well as decorated Peach Opal. SINGLE FLOWER Basket Interior - Plain. SINGLE FLOWER Exterior. 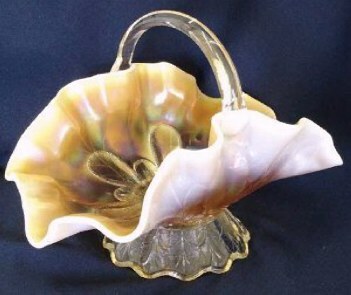 SINGLE FLOWER Handled - Basket: Found only in peach opalescent to date, the pattern dates to the 1909-1911 era. It vanished from wholesale catalogs following the 1912 fire. Interior has no pattern. These rare baskets have an applied handle of clear glass. SINGLE FLOWER Bowl: is an exterior pattern, comprised of three groups of stemmed flowers surrounding the bowl and a large leaf spray with flower blossoms fills the center of the base. 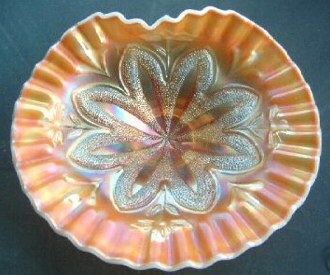 Ruffled bowls 7 ½”-8 ½” in size, found in marigold, amethyst, peach opal and some with enamel decoration in peach opalescent. Left - DOGWOOD SPRAYS displays Long Leaf pattern on exterior and pedestal base. Right - STIPPLED PETALS Basket in P.O. displays LONG LEAF Exterior pattern extending down over the dome-foot. DOGWOOD SPRAYS: is a rather obscure pattern as compared to some of the others dating back to the Dugan era, circa 1909-1913. The intricate pattern is found only on the interior of dome-footed bowls and dome-footed compote which was shaped from the same mold. The exterior pattern displayed on the scalloped foot is of the same configuration as that found on the Stippled Petals bowls/handled baskets. That pattern appeared in wholesale catalogs in 1910. Both patterns also carry the Long Leaf exterior design. Dogwood Sprays is found most often in amethyst, followed by peach opal. Oxblood examples will require some searching, with marigold seen much less often. A few cobalt blue bowls are known, with only one example known in blue opalescent. STIPPLED PETALS / LONG LEAF: Stippled Petals was one of the earliest of Thomas Dugan's carnival creations. 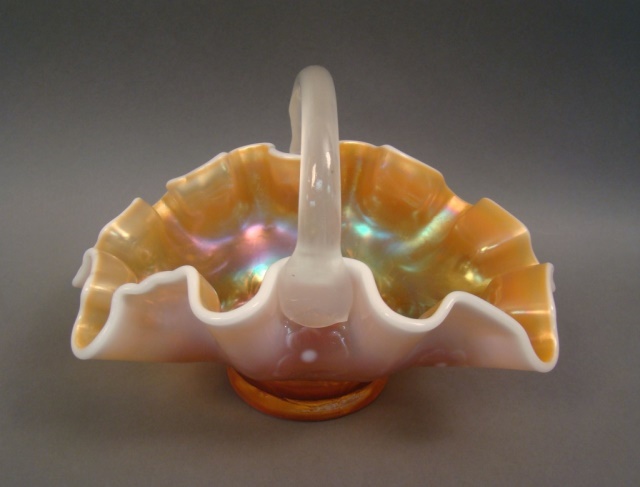 The dome footed compote and handled basket appear in the Fall 1910 Butler Bros. catalog in peach opalescent. The compote is offered in peach opalescent with painted enamel floral decoration. The decorating department in the Dugan factory was quite large. Four carnival shapes, all fashioned from the same mold, having the Long Leaf exterior pattern on the scalloped dome foot are known. 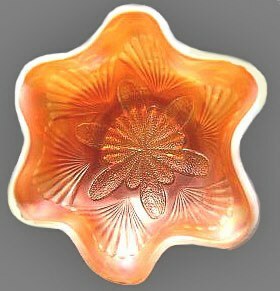 As with many Dugan patterns, little marigold was produced, so a Stippled Petals bowl in that color is quite scarce. 8”-9” bowls are the most frequently found shape. They may have a three and one crimp, or be broadly ruffled, having as many as 10 flat, square ruffles. 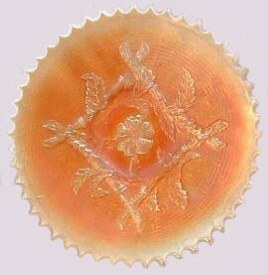 Peach opal is the most available color, with few amethyst examples available. The banana bowl with two sides pulled up is found less often. The compote was fashioned by pulling up the body of the piece to a depth of some 4” to as much as 6”. Whether found in peach opal with plain interior or with floral decoration, it is a “rare find”. Stippled Petals handled baskets, fashioned from the banana bowl shape have a separately applied, clear glass handle which spans the two highest points. The baskets are rare and command a great deal of attention whenever offered for sale. Peach Opalescent is the only color known. (LONG LEAF): This is one of the designs carried over into carnival use from the earlier opalescent glass production. It appears in the 1907 Dugan factory catalog. Carnival production of this pattern was limited to use as an external design on the dome foot of Dogwood Sprays and Stippled Petals pieces. HOLLY & BERRY: The striking similarities in design between this and the Christmas Compote produces rise for speculation that they may have been intended to compliment one another. However, we have no proof for this. The small 6”-8” ruffled bowls are seen most often, with amethyst being the prevailing color. As with many Dugan examples in amethyst, the color can be spectacular. Peach opalescent is the next most available color. Most have good solid coloration and iridescence. Again, marigold examples are seen less frequently. Single-handled nappies, in both spade shape and ruffled appear somewhat equally in amethyst and peach opal. Somewhat few marigold nappies are known. A few have been reported in cobalt blue. As for the term: gravy boat in connection with the spade-shaped nappy? Since this early carnival glass was not tempered, it would be quite a risk to attempt placing hot gravy into one of these! PETAL & FAN: Here is another of the early geometric designs from Dugan. 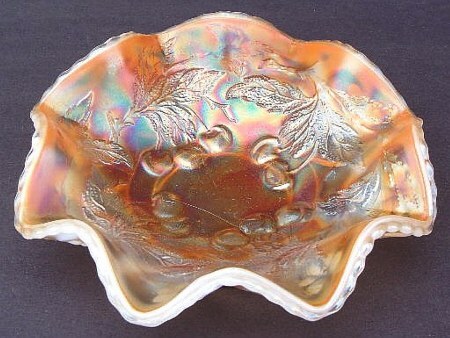 Peach opalescent bowls in this pattern appear in the Fall 1910 Butler Brothers catalog and continued to appear through the Spring 1911 issue. This pattern is always accompanied by the Jeweled Heart exterior pattern. 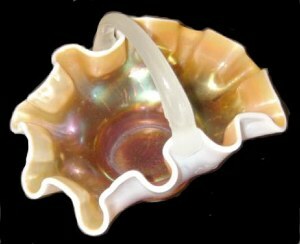 Ruffled bowls such as this lovely little 6” example are familiar items with the peach opal being the most frequently found color. Berry sets in amethyst and white would be difficult to put together though. We could call it “scattered availability”. Marigold examples are quite scarce. The master bowl is 8”-9” in size. 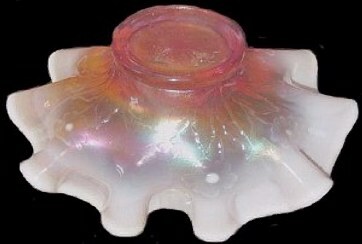 A small banana-shaped bowl with 2 sides pulled up surfaces occasionally, only known in peach opal. MY! What a difference a crimping tool can make! Take a small bowl from the mold, apply that tool to the edge and a “loosely-termed plate” results. Desire and price adjust upwards to attain one of these very scarce 6”-7” beauties! The “plate” shape has only been found in amethyst and peach opalescent. The large 11” Petal & Fan bowl was featured in an assortment which appeared in a Christmas 1910 Butler Brothers Wholesale Catalog. 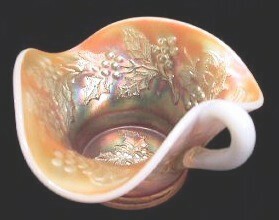 The term “aurora” was often used by Butler Brothers to market Dugan's peach opalescent carnival glass. compliment each other can be used by the Spirit to produce saving faith.